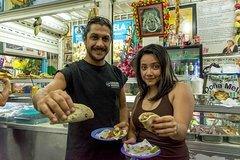 Our foodie adventure around Guatemala City will begin with a stroll along the famous La Sexta Avenida, to soak up the Latin vibe given off by the street performers, artists, and vendors that dot the street. This area has been totally revitalised in recent years and it is here we will see some of the city’s most magnificent buildings, including the Police Headquarters. Then we are off to explore the riot of colour and noise that is the Mercado Centrale, one of central America’s largest markets. We will chat with local food vendors who will offer us some of Guatemala`s most delectable fresh produce to try. Our last stop will be at one of the charming coffee shops in the old centre where you will try one of the world’s premium coffee beans and quite possibly the best coffee of your life! A dessert made with authentic Guatemalan ingredients accompanies your liquid black gold. We will then head back to our original meeting point with happy stomachs and a head full of treasured memories. Remember to ask your local guide for the inside track on what to see and do next during your Guatemalan adventure.